No matter how many demons we slay, more rise to take their place. No matter how many of their servants we put to the torch, Satan's get corrupts more. Yet we shall not fall to despair, for God is on our side, and faith can - and shall - move mountains. Let the fiends be the ones to cower, for we are coming for them, and nothing shall stay our righteous hand. Amen. 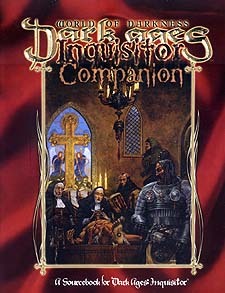 In the first sourcebook especially for Dark Ages: Inquisitor, we present detailed information on the shadow Inquisition, including tips on building characters, dealing with the Holy (if ignorant) Church, and the secrets of each of the five orders. The Dark Ages: Inquisitor Companion also includes a new look at roleplaying Faithful characters, along with new Blessings to aid in the fight against the Adversary.